October 4 is the feast of the “poverello” the poor man, Francis of Assisi, on both the Roman and Byzantine Catholic calendars. I was raised a Roman Catholic, and at my Confirmation I took the name of this wonderful saint as my patron. When my father retired from the police force, he was given an outdoor statue of St. Francis since he was the one who was called whenever a stray dog was found: they knew the dog would go right away to my father. We just have this knack that ties us to Francis, who is famous for many things, including his relationship with wild animals. When men failed to heed his call, the wild animals did. 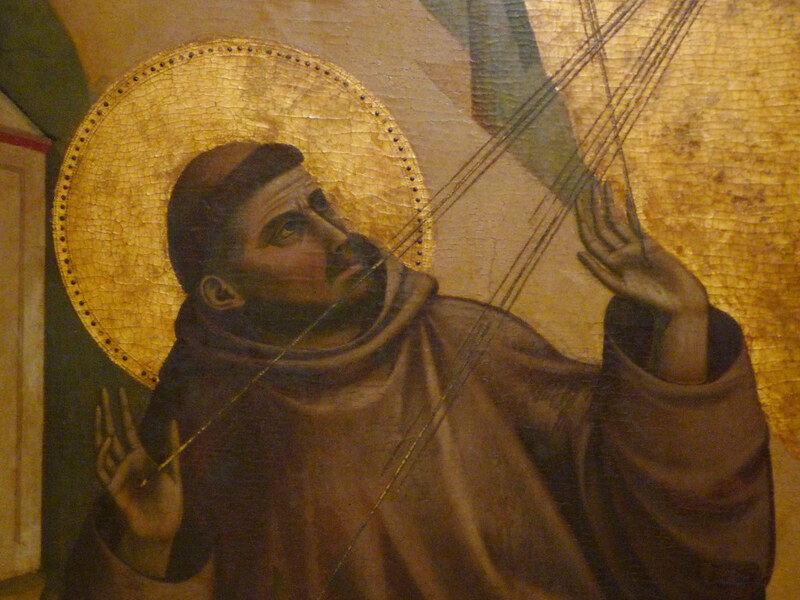 Saint Francis was famously converted from a life of luxury and wealth to becoming the poorest of Jesus’ followers. Radically in love with Christ, a man who could kiss a leper covered with open sores, Francis said that he would bow before a priest instead of an angel, because of what the ministry of a priest brings to the world. An ordained deacon, Francis set Italy ablaze as sons and daughters of leading families gave up everything in order to witness to Christ in absolute poverty: the men wandering the land preaching, the women living in poverty as the Poor Clare Nuns behind cloister walls. Francis’ deep love of Jesus led to him creating the living Nativity scenes, which gave us today’s many Christmas cribs, and to embrace Christ Crucified so well that he was given the five wounds to carry in his body. Birds listened to his preaching, the fierce wolf of Gubbio became a beloved pet of the city, and men’s hearts returned to God in an age of abandonment. Pope Innocent III saw Francis holding up the tottering church in a dream, and so he gave papal blessing to the creation of the first of the mendicant Orders. Our Metropolitan William is a former Byzantine Franciscan, we have one Byzantine Catholic friary in the US, and there is a flourishing community of friars in the Eparchy of Mukachevo. The simplicity and passion of Francis appeals to the Eastern Christian mind. The wolf of Gubbio extends his paw to make his pact of peace with Francis. The wolf is buried in the church of St. Francis in Gubbio, and the skeleton shows that he was a formidable wolf indeed, of great size! In today’s epistle, 2 Corinthians 15, Paul writes of himself, in defense against attacks by some opponents in Corinth. The first heaven consisted of the earth atmosphere where the clouds and birds were. The second heaven was where the sun, stars, and moon was. 3rd heaven – the dwelling place of God and the angels. God allows him to enter into heaven so as to strengthen him for the apostolate he had, which had many joys but a lot of hardship including stoning and flogging at the hands of his own people. So as to remain humble, he has a mysterious thorn in the flesh – nobody knows what it is though writers speculate constantly with absolutely no proof. But it is that thorn combined with prayer and dedication that has been the authentic Christian’s path ever since. Francis knew a lot of suffering. He was a prisoner of war for a year, literally thrown into a dark hole of a prison, and when his eye problems became so bad that he was almost blind, the pope ordered him to undergo a very painful operation that did nothing to help him – but he wrote the Canticle of the Sun afterward, which begins: Most High, all powerful, good Lord/ Yours are the praises, the glory, the honor, and all blessing. Not what I would have been thinking of at that moment. We remember him for his connections with animals – the birds who came to listen to him, the wolf who gave up killing people and animals in order to live inside the town of Gubbio. What does that mean though? The Matins for his feast says: Having recovered the intimacy of old btw human nature and its Author, you reestablished the harmony between people and wild animals. – in other words, the wild animals found in him a restoration of Adam who had lived in peace in the garden of Eden, how we were meant to live originally. His canticles include brother sun and sister moon, but also sister poverty and sister death. He’s no hippie jumping through the flowers – he suffered physical pain and blindness – but after 40 days of fasting, Jesus imprints on him the five wounds, the stigmata, for the first time. His hands and feet were torn like the heads of nails, and a deep wound pierced his right side. Very painful, yes, but also a sign that Francis so loved Christ our God and Savior that he opens himself up to this suffering so as to carry a permanent reminder to himself and everyone near him of exactly what the poor man of Nazareth suffered, so as to redeem our poor selves, and he gives us a challenge – how much do we love, how simply do we live, how gentle are we? Because of their humble witness, the Franciscans were given custody of the Catholic shrines of Jerusalem and Bethlehem by the Muslim rulers, a role they continue to today as the Custody of the Holy Land. Francis is the patron saint of animals, the environment and ecological studies, against dying alone, those who work with or care for animals, Santa Fe and New Mexico, Nambe Pueblo, San Francisco in California, and of peace. You can read about the work of the Franciscans in the shrines of the Holy Land, in Latin rite schools and parishes in Israel, the West Bank and Jordan here: http://www.custodia.org/. Now with the crisis of ISIS/ ISIL their work in Catholic-Muslim dialog and among displaced Christians becomes all the more important. 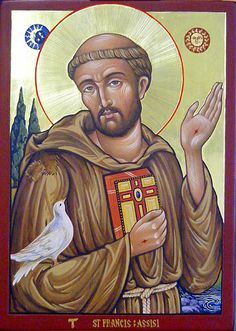 Saint Francis, beloved of Christ, help us to grow closer to our dear Lord in simplicity, peace, charity, and joy! Thank you for posting this Fr. Chris. So very informative. I loved reading about one of my very favorite saints.